This week definitely went by quicker than any other so far. On Tuesday, we had Zone Training pretty much all day. We had to leave around 7:30am to drive the hour to Powell to make it there on time. We mostly do discussions and role-play at our trainings. After training, exchanges started for us! Our exchange was a little different because since we’re so far out from everyone else, it wouldn’t be efficient to truly switch companions. So instead, one of our Sister Training Leaders just came back with us after training. It was kinda weird having a third person for a day and a half, but she did give us some really good direction on how to teach more effectively and so forth. One Wednesday, we had an awesome lesson with a part-member family. The husband and two children who aren’t members were really open to our message! We invited them to read the Book of Mormon as a family- I know that it will truly help bring them closer to Jesus Christ and to one another. We’re meeting with them again tomorrow, so here’s praying that they kept their commitment! On Wednesday as well, we ate lunch at the local Senior Center. As I’ve said before, probably half of the population of Meeteetse is elderly. So on Mondays and Wednesdays, the Senior Center hosts a free lunch for anyone over 65. Seeing as we’re not 65, we did some volunteer work there and earned our lunch. It was such a nice time! We had the director announce us as basically “free labor”, and we were able to set up a ton of service appointments! We also went to the Meeteetse Chocolatier that day. Seriously, SUCH GOOD CHOCOLATE. Apparently, the Chocolatier is what Meeteetse is famous for. 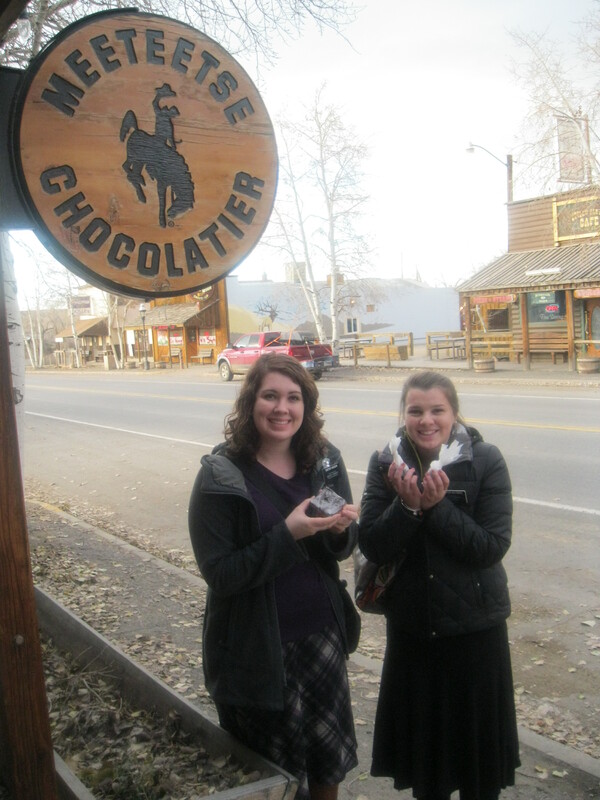 We got truffles and a brownie to share- oh man, they were good. 🙂 That night we drove the sister trainer to Cody to meet everyone halfway for the tradeoff. I don’t know if I told you, but I’ve actually been the driver in our companionship since day 1! Since my companion is waiting for her visa, she didn’t submit all her driving stuff beforehand like I did. So I was the only one approved to drive initially, so I’ve been doing it ever since! We drive a really nice 2013 Toyota Corolla- dang I’m getting spoiled to that car. Our iPads are a wonderful blessing to have, but they are also a trial sometimes!! We finally got them to “sync” with each other this week, and in doing so it duplicated our entire schedule and everyone in our records. Gahh! We really are test-piloting these things, because they most definitely have bugs. It took us like an hour to get it all sorted out. Oh, and guess what? I am now on Facebook! My name on it is Sister-Dana Hoggan. I’m not allowed to be friends with anyone outside my area, but everyone from home can “follow/subscribe” to my updates if they so wish. 🙂 I have yet to actually post anything yet, so hopefully I’ll get it going pretty soon! Saturday was my one month mark! On Saturday, we had yet another meeting we had to go to. This time it was in Lovell, which is an hour and a half away. This training was for all the trainers/trainees in both the Wyoming Zones. President Mecham was there as well! My companion and I were among the first to arrive, so I actually was interviewed first by him. One thing I remember from the interview was that he shared with me Moroni 7:17, in regards to distinguishing the Spirit. Too often I think we doubt the Spirit’s influence, and instead think that it’s “just us”. But as the scripture says, we really have been given a way to “judge” whether it is from the Spirit. 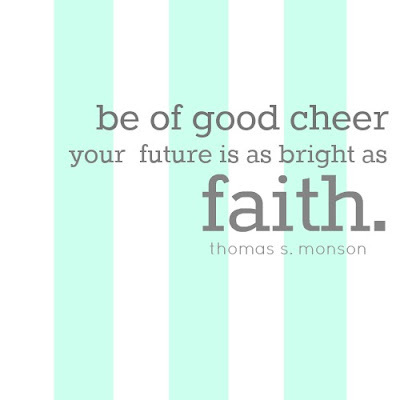 As President Mecham said to me, anything that is good and could lead someone to Christ is a prompting from the Spirit! As baptized members of the church, we really can have the Spirit with us always- and we should expect to recognize those promptings every day, not just at special spiritual times! Saturday night, we had one of the more… interesting lessons I’ve had since coming on my mission, haha. We taught a less-active and her non-member husband. We had it at the Bishop’s house, so that was really good to have him there to testify. The husband is an individual that is, well, very affected by the shows he sees on the History Channel. We spent probably half of the lesson listening to why he believes in aliens, Bigfoot, etc. He believes in Joseph Smith, but just that it was aliens that visited him rather than the Angel Moroni. We tried really hard to build on the knowledge that he had, but man, we just struggled in that lesson! I know that Heavenly Father has a purpose for us to meet with him though, so we will continue in faith!! On Sunday after church, we raked leaves for like two and half hours as service. My shoulders are feeling it today! Service really is one of my favorite parts of being a missionary though. We had another really, really good lesson with an investigator last night too (he was the one I wrote about last week). He seriously has the most pure desires to know the truth of anyone I have ever met. He has some stumbling blocks with the Book of Mormon (mainly historical/scientific), but I know that once he knows it is true, he will be so solid. I feel so blessed with this opportunity to teach him! ← The Lord Answers Prayers!